The System 1200 the ASB command center for MINIMAX and Pro-12. Together these two synthesizer classics give you a wide range of sounds. Within the MINIMAX, we have remodelled all significant sound elements after the original's circuitry. In addition, a steady cross-check with the Original was made and now offers even identical knob positions as within the original. No reproduction has yet been that precise. Measurements and adjustments were only a part of the work. Beforehand there was another problem to tackle. The original analog model produces frequencies which when copied or emulated would produce aliasing. Those who are familiar with aliasing know how awful it sounds. The MINIMAX ASB's sound generation is based on newly developed algorithms that are free of any aliasing. The MINIMAX ASB handles even the most complex Modulations, filter FM or Oscillator-Modulation. Moreover, the nice thing about this, the MINIMAX will always sound like the original. Thus MINIMAX ASB tops today's digital synthesis technique. 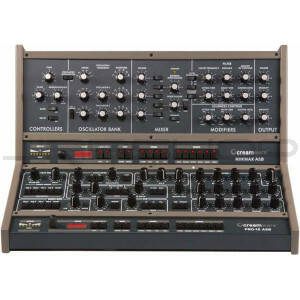 The design of the PRO-12 ASB is now regarded as classic synthesizer style. Two oscillators with multiple waveforms (which may be played independently or simultaneously) constitute the main sound source. The oscillators are mixed with white noise in the mixer section, then routed through the 24dB lowpass resonating filter and amplifier section.